Heading to St. Augustine we noticed a ton of motorbikes on the highway and soon learned it was Bike Week in Daytona. 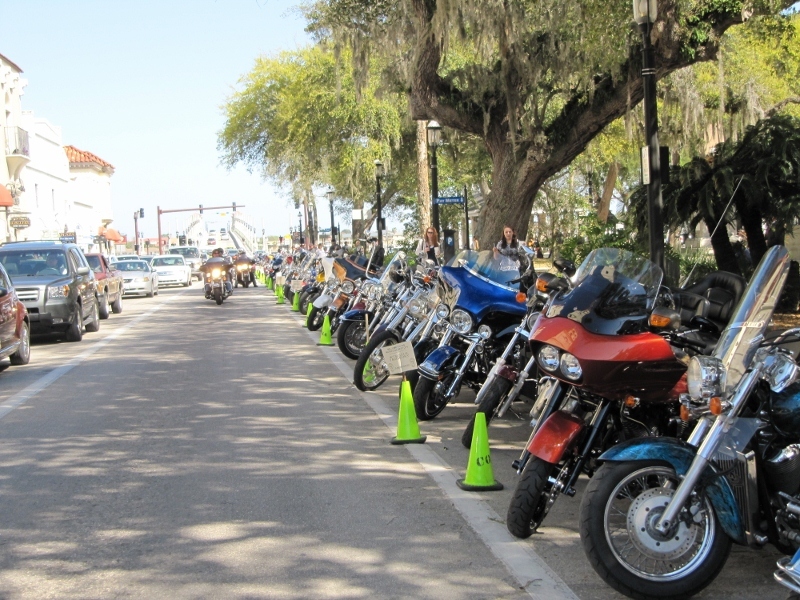 Bikes galore cause it's Bike Week in Daytona! Is it a bird, or a plane? 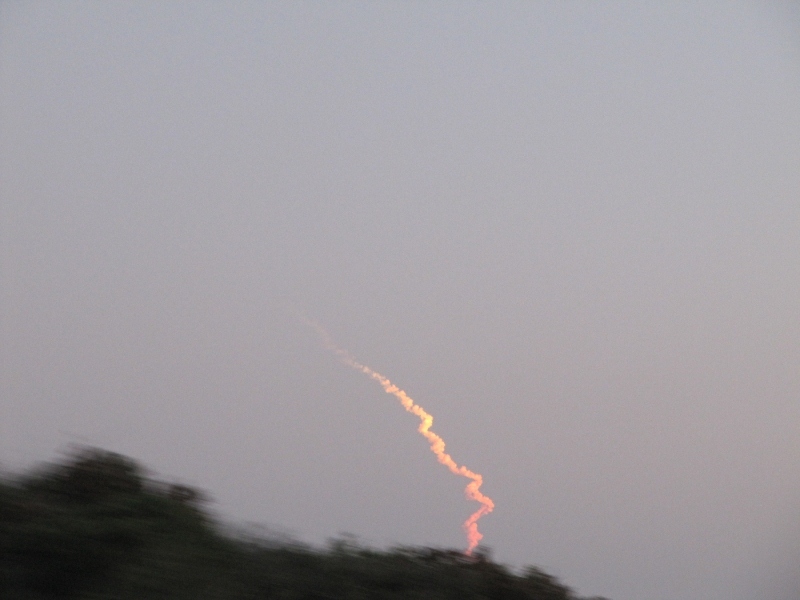 Nope, it's a satellite! 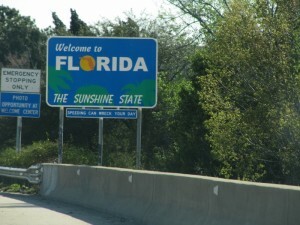 We rolled into St. Augustine quite late so we stayed the night in the Walmart parking lot. 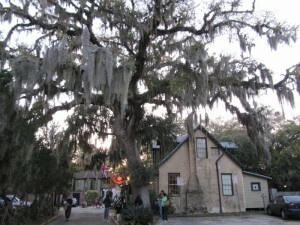 Huge oak trees with Spanish Moss greet us in St. Augustine. The historic district is great. 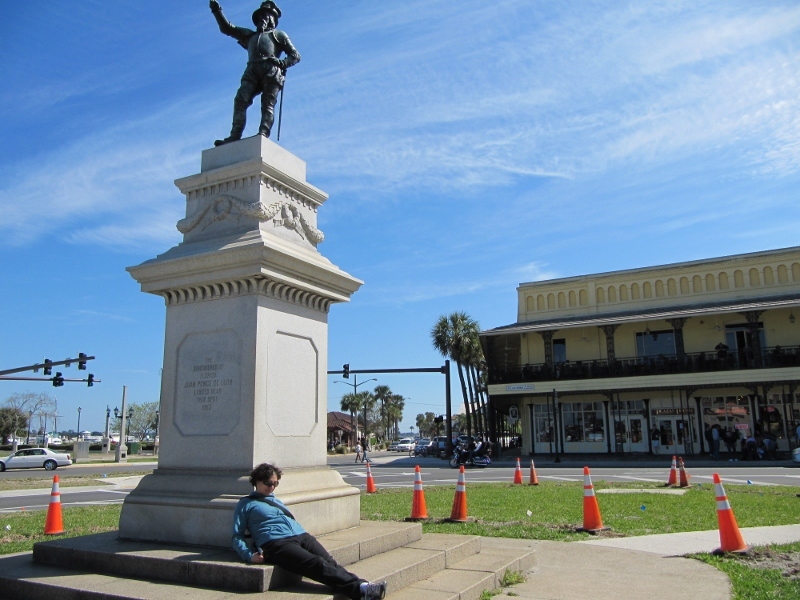 Did you know that St. Augustine is the oldest continuously occupied (European-founded) city in continental US. 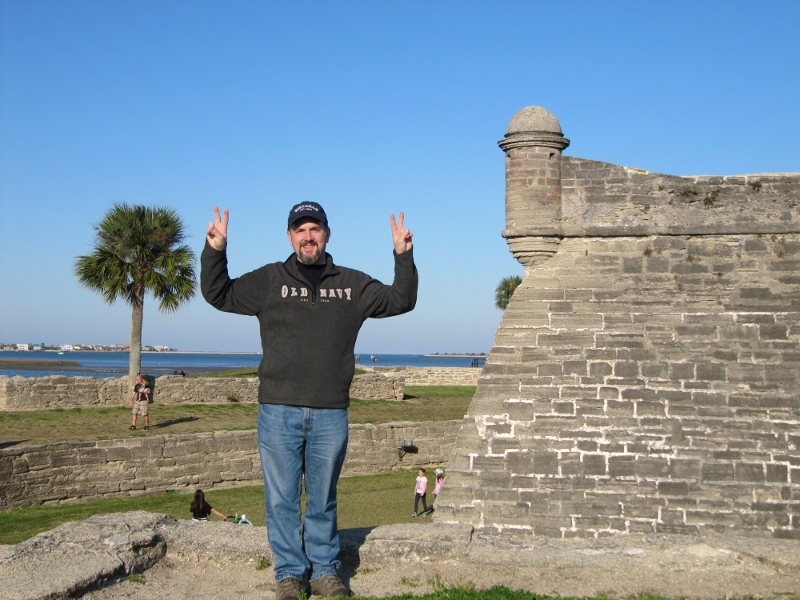 Jason enjoys Castillo San Marcos - a fort located in St. Augustine's Historic District. Construction was completed in 1695. It has never been defeated in battle. Marianna relaxes while Ponce de Leon points the way to the Fountain of Youth. He thought he found it when he landed on these shores in 1513. What does 2 plus 2 equal? 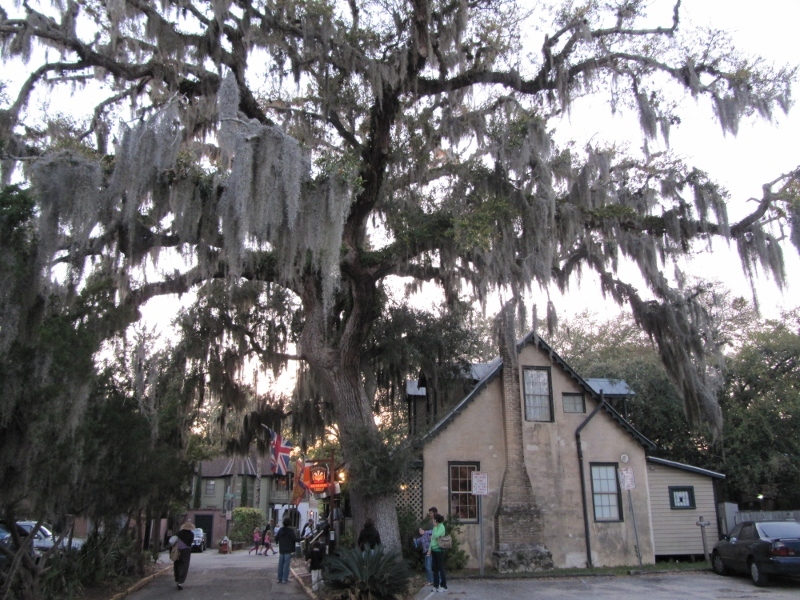 Learn all about it at St. Augustine's oldest school house. 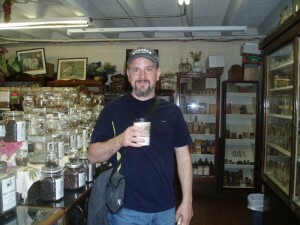 St. Augustine’s oldest drug store had some interesting remedies. 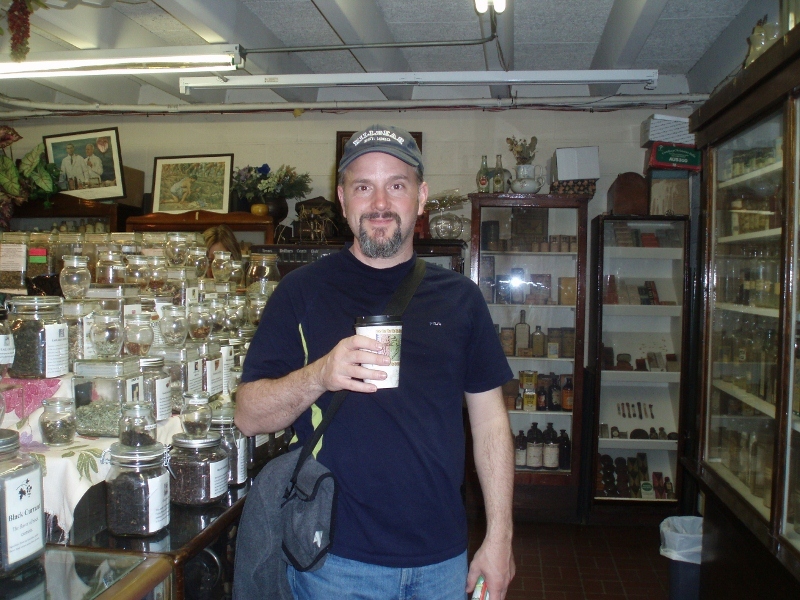 Nothing a “coffee” can’t fix – right Jason? The kilt-wearing Storm Troopers were an interesting addition to the St. Patrick's Day Parade. 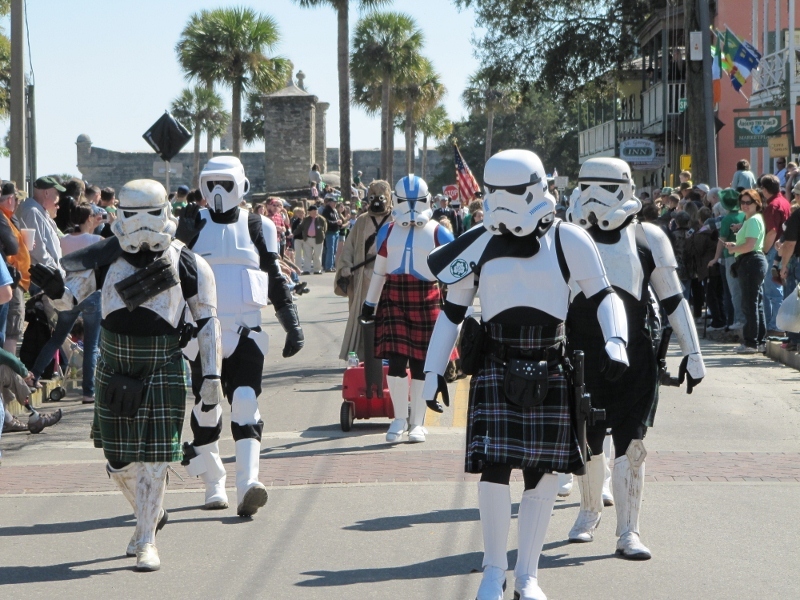 Even though it was March 12th, the celebrations for St. Patrick's day were in full swing. While watching the parade we chatted with an interesting lady from Brampton. She moved to the US in the late ’80s and just loves it here. It helps that she is a dual-citizen (Canadian and US). Her kids continue to live in Canada and her mother lives in New York. 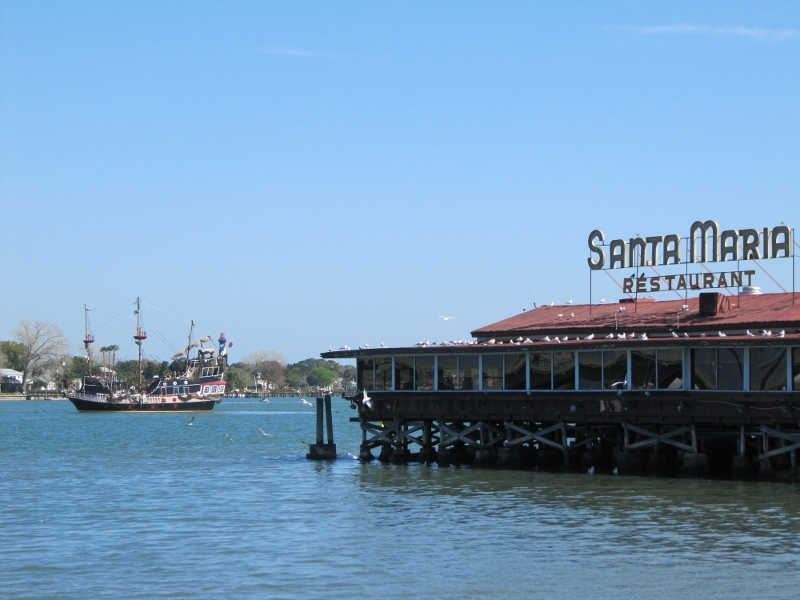 We ate lunch at Santa Maria - a restaurant we visited during our first trip to St. Augustine almost 16 years prior. It was hokey but cute at the time, and continues to be. We split a meal of blackened shrimp with garlic couscous. There was enough left over to make dinner too! 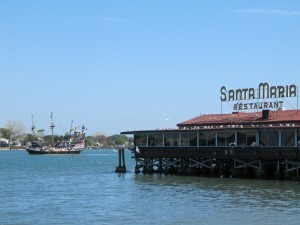 An interesting feature of the Santa Maria restaurant is that you can feed the catfish directly from your table. 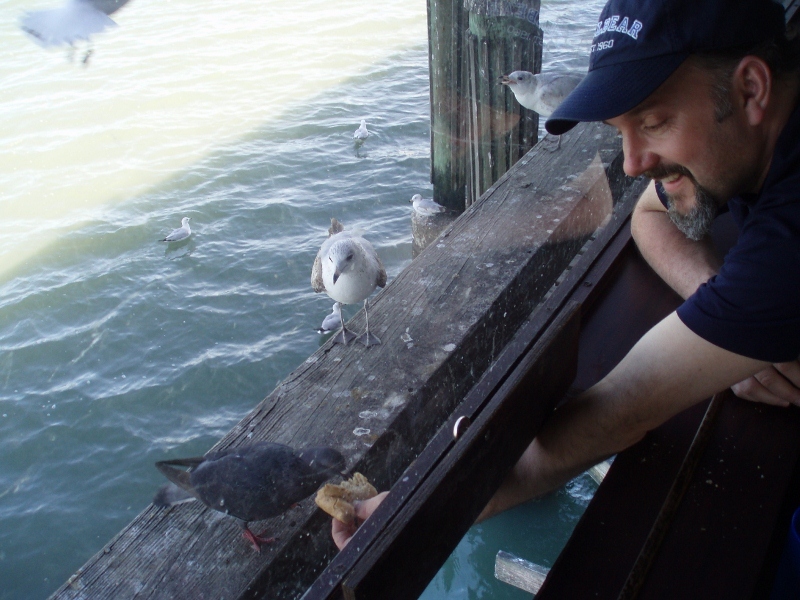 Apparently pigeons and sea gulls learned about this neat food hand-out station too! In this shot, Jason feeds the 'fish'. 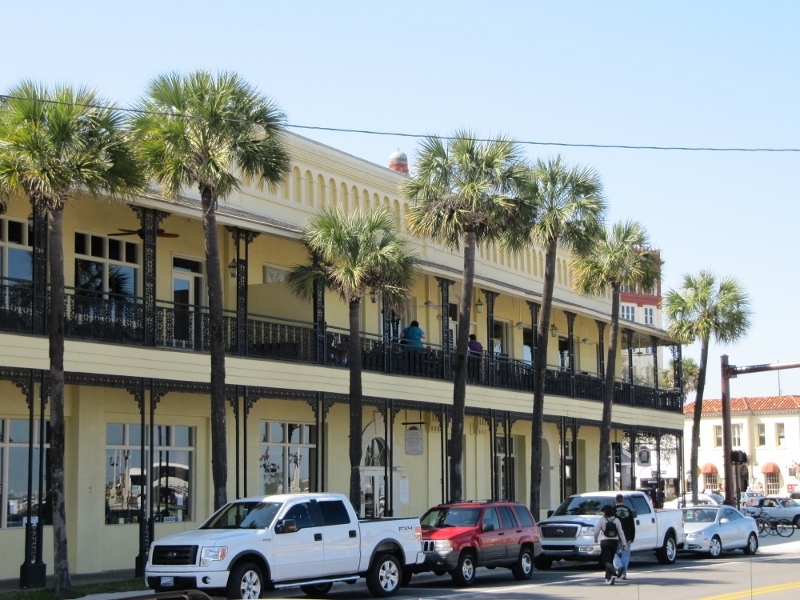 This building style is typical of Henry Flagler - a tycoon whose influence is visible throughout Florida. 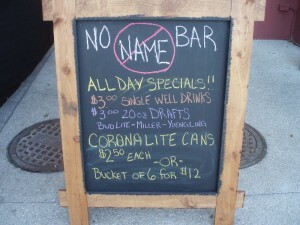 This place is so laid back they don't bother to name some of the places. No Name Bar was our last stop of the day. After a full day of touring the city, we opted to stay at WalMart for the night. Not long after settling in the battery started to dwindle. For fear of causing the fridge to turn off, we shut off all the lights – using candles and lanterns instead. Since the battery was new, and it’s meant to charge while we’re driving, the fact that it konked out was a bit concerning. 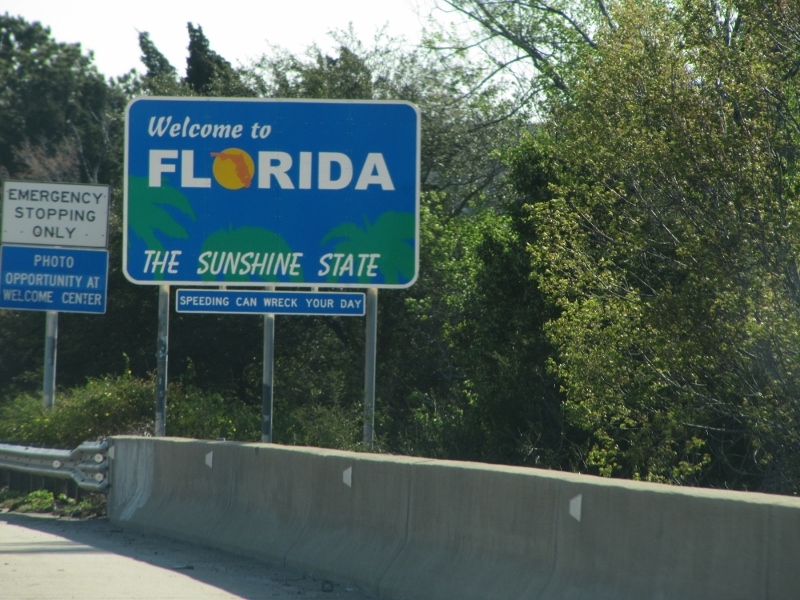 We made a mental note to observe how it charged as we drove to Key West the next day….but that’s another story…stay tuned. Hello again my kids! This is so great…the minute I see your emails I’m so happy to send a note back. I remember when you went to St. Augustine way back those 16 years ago and you loved it then. 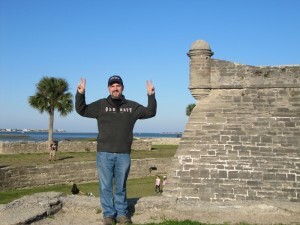 It 30C here today and yes sunny… Lindsay is fine (bit of a sinus infection) and I’m still the same Weenie. Looks like you guys are having a great time. Enjoy your travels and keep up the posts!